Rinse basil in water and chop with a knife (I prefer to use kitchen scissors). Place in small bowl and add minced garlic and olive oil and mix well. Set aside. Boil macaroni until soft and drain. Place in a extra large bowl and drizzle with olive oil so the noodles won’t stick together. 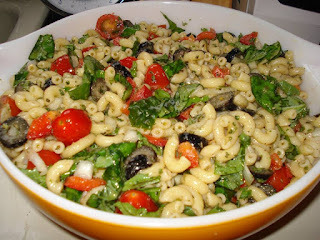 Add olives, bell peppers, onions, tomatoes and basil mix to the macaroni and mix together. Mix the dried ingredients in a small bowl or in a medium jar. Add vinegar, olive oil and water and either whisk or shake. Pour over salad and mix well. Refrigerate for several hours to overnight. Enjoy! Serves 12.